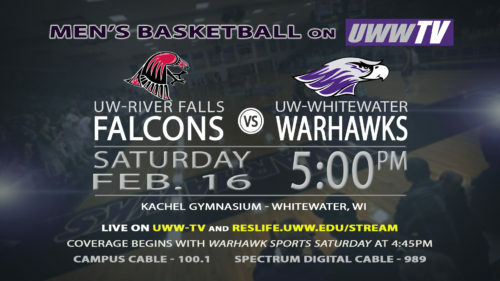 UWWTV – The UW-River Falls Falcons Swoop into Warhawk Territory – Tomorrow Night on UWW-TV! In this heated all or nothing game for the last remaining spot in the WIAC Tournament, UW-River Falls flies into Warhawk territory. Tomorrow evening at 5:00 pm CDT, ball toss is set for the last regular game of the men’s 2018-2019 season. This is the last opportunity for both teams to clench a spot in the WIAC Championship tournament beginning in the next week; this is not a match that you want to miss. Pre-game coverage with Warhawk Sports Saturday begins at 4:45 pm CDT where we will be filling you in on all of the Men’s Basketball happenings around the WIAC. UW-River Falls soars into the match-up with an 11-13 over all record and a 4-9 in the conference, while UW-Whitewater brings an overall of 16-8 and 5-8 in conference. Despite records, this is a match that comes down to the performance of the night. One will win and move onto the WIAC Championship tournament as the sixth seed, and one will lose and go home for the season. 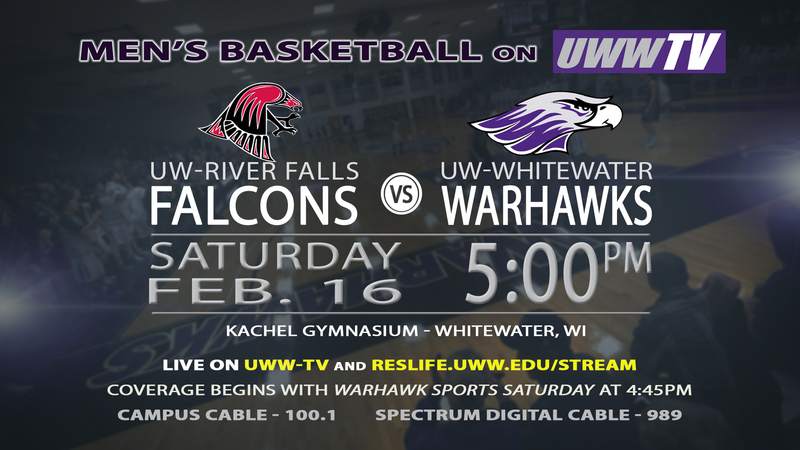 A match of skill and focus is in store, tune into UWW-TV tomorrow evening at 4:45 pm CDT for all of the WIAC Basketball intensity!